To offer a unique and fresh perspective, the AHCA Falls Subcommittee, an extension of the Clinical Practice Committee, has created a fabulous week-long event focusing on falls awareness and reduction. Building off of last year’s contribution – A Guide to Managing Fall Risks – the committee has created a week-long series of webinars to support staff and families. These are just a few of the offerings. The webinars will be recorded so that you can watch them any time. BUT! The committee has engaged the speakers to be available every afternoon at 3PM (Eastern) so that listeners can talk with that day’s presenters. The webinar series will occur Monday, September 22nd through Thursday, September 25th. The program will be formally promoted beginning in July. Watch for details! This coming October, LTC Trend Tracker will receive a brand new upgrade! AHCA aims to make this free member resource easier for users to navigate, along with a more modern online look. This means the current platform will no longer be available to users starting October 31, 2014. Please verify your organization and user lists. These lists were sent out to organization account administrators in May. Please contact data.support@ltctrendtracker.com to receive your list. Also, all current username and passwords will be changed at launch. So, please send us your information so you can log in in October. If we don’t receive verification from you, you will not be able to access the site. If you use the system for incentive purposes for staff, please download the data before October 31, 2014 for your organization. New data will not be updated in the current LTC Trend Tracker system as of September 30, 2014. There will be a new login in page for LTC Trend Tracker beginning on or around October 10. Please ensure you've bookmarked www.ltctrendtracker.com. This will allow you to keep up with important updates to the upgrade. AHCA and the LTC Trend Tracker team are looking forward to the launch of the new system in October. If you have any questions or need further information on this please email data.support@ltctrendtracker.com. CMS Central Office Staff will observe a pilot surveys and will not assist in surveyor’s interpretation, nor will they encourage “aspirational” goals of surveyor guidance. There will be specific tools used during the survey. These tools will follow the guidance for F309 and F329. Training for State Survey Agencies and state surveyors will begin during the first week in July. What can you do to get prepare for a dementia care focus survey? Review and use all the documents that were released with the new guidance for dementia care at F309, in particular the Surveyor Checklist which is the last two pages of the S&C memo and attachments. Review and use the QIS Critical Element Pathways for Unnecessary Medications/Medication Regimen. When AHCA learns more about the pilot surveys and the states that will be using them, we will let you know. 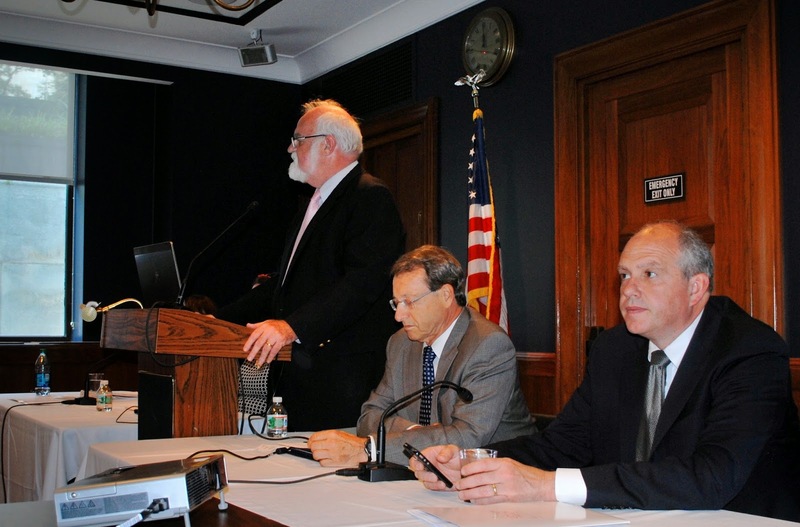 Dr. David Gifford, MD, MPH, Senior Vice President of Quality and Regulatory Affairs at AHCA presented with a panel on Capitol Hill Monday on the lack of comparable data across Medicare’s post-acute care settings. 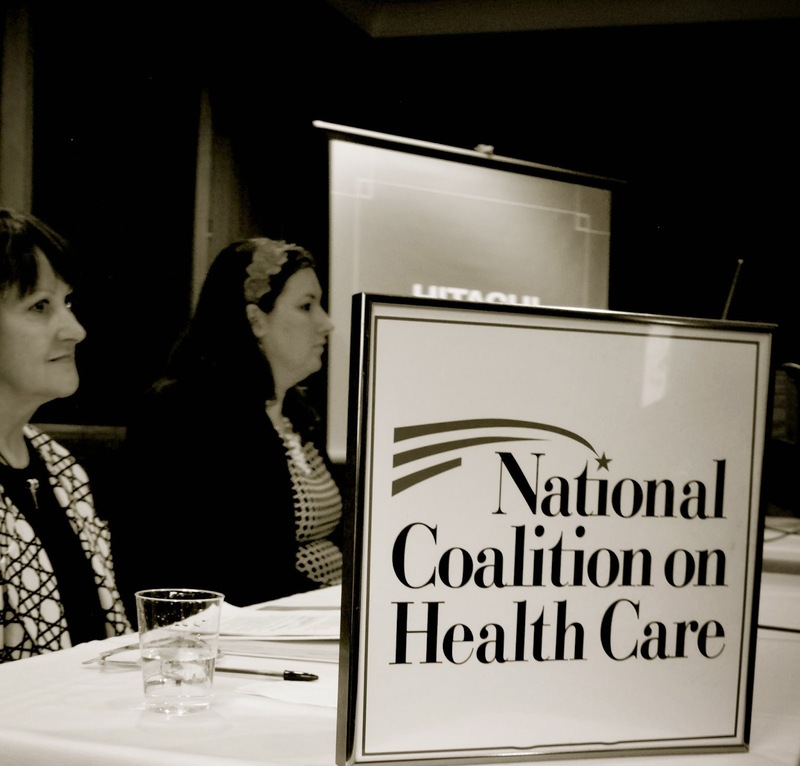 The panel organized by the National Coalition on Health Care and Long Term Quality Alliance also included Judith Tobin, Managing Director at Brookings Institution and Lisa Grabert from the House Ways and Means Committee. The IMPACT Act of 2014 would help complete goals to standardize data used to compare quality and outcomes across post-acute care settings. The bi-cameral, bi-partisan IMPACT Act (discussion draft available here) has been pending for years (some argue decades) with a focus on post-acute care improvements in quality measurements taken consistently and then used to make recommendations to Congress and MedPAC. Quality of care is critical but in order to accurately compare information the same scales of measurement must be used in all settings. The proposed deadlines for implementing the new tools developed could be October 2016, October 2018 and October 2020 with some measures rolled out sooner. First, the long overdue bill has to get in the House. About three weeks remain to register for the AHCA/NCAL Annual Convention & Expo at the early bird rate. Register before July 18 and save $100.00 off the Premium/Full meeting packages. Join your long term and post-acute care colleagues in the Nation’s Capital for four days of networking, learning, business, and fun. This year’s keynote speakers feature General Colin L. Powell, USA (ret.) and Captain Richard Phillips. Don’t forget to make plans to attend the Gala Dinner & Show with rock and roll stars Pat Benatar and Neil "Spyder" Giraldo. This event will sell out! All attendees must first register for the convention before hotel reservations can be made, so don’t wait any longer! We have all been there. Conflict within the family spills over to affect the resident and the staff. Tension, disappointment, stress, and anxiety can follow. Speakers Deirdre Downes, Director of Social Work at Jewish Home Life Care in New York and Betty J. Kramer, PhD Professor at the University of Wisconsin-Madison, will share years of practice, wisdom, personal experience, and research findings about family conflict in the nursing home setting. Also, what you as a social worker can do about it. The University of Iowa's School of Social Work is offering this free webinar on Wednesday, July 9, 2014 4:00 – 5:15pm (EST). Registration is required. Listen to this! A skilled nursing care center operating at the 25th percentile versus the 75th percentile when looking at staff turnover (i.e. operating with a 38% turnover rate instead of a 78% turnover rate), would experience a savings of $668,252[i]! Resources like that could be a game changer for many centers in further enhancing care and quality. That is why it pays to know the cost of your turnover. It is a critical element to the health of your organization. Think about it. What could your center do with $668,252? To support you in addressing staff stability in your center through the AHCA Quality Initiative, AHCA has an updated calculator, exclusive to members that estimates your center’s turnover cost. As you glide over the cells in this simple worksheet, there are instructions to help ensure that you capture the right information. It automatically adds up all of the key elements that are associated with turnover and then (*drum roll please*) gives you a number in dollars. This is the amount of money that you are losing because of turnover. It really does pay to know because this is an infinitely solvable issue. Use AHCA’s “Four Strategies Toolkit” or spring for the Staff Stability Toolkit in AHCA’s bookstore. These are two of the profession’s most powerful resources in curbing turnover by providing very concrete steps and tools to change your turnover rate. Also, try an experiment with us here at AHCA. Fill out the Cost of Turnover Calculator and find out your number. Send it to Marguerite McLaughlin in AHCA’s Quality Department. Your information will be kept private and confidential. Over the next six months, Margie will then send you a few tips or talk with you to figure out a few ways to get your center’s turnover rates down and your resources up! Remember, it pays to know! In a recent report from the US Government Accountability Office (GAO), Medicaid Program Integrity: Increased Oversight Needed to Ensure Integrity of Growing Managed Care Expenditures, the agency concludes that the Centers for Medicare & Medicaid Services (CMS) is failing to ensure proper oversight of Medicaid Managed Care Organizations (MCOs). Medicaid Managed Care is growing at a faster rate than payments under the traditional fee-for-service (FFS); and yet, in the seven states GAO reviewed, five state Program Integrity (PI) units and four Medicaid Fraud Control Units (MFCUs) indicated that they primarily focus their PI efforts on Medicaid FFS claims and have not begun to closely examine PI in Medicaid MCOs. In addition, the report finds that federal entities have taken few steps to address Medicaid MCO PI. Specifically, CMS has largely delegated managed care PI oversight activities to the states, without updating any CMS PI guidance. Further, CMS does not require states to audit Medicaid MCO payments, and state officials told GAO during this study that they need additional CMS guidance in this area and the option to obtain audit assistance from existing Medicaid PI contractors in overseeing Medicaid MCO PI. The report recommends that CMS increase its oversight of PI efforts by requiring states to audit payments to and by Medicaid MCOs; update its guidance on Medicaid MCO PI; and provide states additional support for Medicaid MCO oversight. To obtain a complete copy of the GAO report go to http://www.gao.gov/products/GAO-14-341. The Occupational Health and Safety Administration (OHSA) published a free brochure on the elements of a successful safe patient handling program. It includes five common myths and realities about the topic including that staff are more accepting if they are familiar with mechanical lifts. OHSA tries to dispel the notion that mechanical lifting takes more time to accomplish than manual lifts. The pamphlet also describes a six-step process for having a successful safe patient handling program. Check it out here. To view the entire OHSA library, go here. Earlier this month, Connecticut Governor Dan Malloy signed into law a bill, HB 5535, which requires hospitals to tell patients whether their stay is classified as “observation status” or as traditional inpatient. Without receiving this notification, many patients have been surprised to learn of the high out-of-pocket fees that they have to pay but thought would be covered. More details about the new Connecticut law can be found in this AARP article. Similar laws already exist in the states of Maryland and New York. As noted in previous editions of Capitol Connection, AHCA/NCAL has been advocating on the Hill on the observation status issue. AHCA/NCAL continues its support and advocacy for legislation, The Improving Access to Medicare Coverage Act of 2013 (S. 569/H.R. 1179), introduced by Reps. Joe Courtney (D-CT) and Tom Latham (R-IA), along with Sen. Sherrod Brown (D-OH), which seeks to count all hospital days spent in observation towards the three-day stay requirement. Currently, S. 569 has 25 bipartisan cosponsors, while H.R. 1179 currently has 152 bipartisan cosponsors. AHCA/NCAL also continues its work as part of the Observation Stays Coalition, which now consists of 30 organizations advocating for this important legislation. For more information about observation stays, please visit the AHCA/NCAL website. The US Department of Health and Human Services, Office of Inspector General (OIG) has released a report, Performance Data for the Senior Medicare Patrol Projects: June 2014 Performance Report, which provides data showing that the Senior Medicare Patrol (SMP) projects are still successful. In 2013, 54 SMP projects had 5,406 active volunteers, which is a 5 percent increase from 2012. These volunteers conducted 148,235 one-on-one counseling sessions, with a 31 percent increase from 2012. These same volunteers also conducted 14,924 group education sessions in 2013, compared with the 14,748 sessions that they conducted in 2012. In 2013, the expected Medicare and Medicaid recoveries that were attributable to the SMP projects resulted in $9.1 million, a 50 percent increase from 2012. However, total savings to beneficiaries and others decreased from $133,971 in 2012 to $41,718 in 2013. Lastly, cost avoidance on behalf of Medicare and Medicaid beneficiaries and others increased by 26 percent from $113,692 in 2012 to $143,282 in 2013. To obtain a complete copy of the report go to http://oig.hhs.gov/oei/reports/oei-02-14-00140.pdf. The US Department of Health, Office of Inspector General (OIG) has just released its updated List of Excluded Individuals and Entities (LEIE) database file, which reflects all OIG exclusions and reinstatement actions up to, and including, those taken in May 2014. This new file is meant to replace the updated LEIE database file available for download last month. Individuals and entities that have been reinstated to the federal health care programs are not included in this file. The updated files are posted on OIG’s website at http://www.oig.hhs.gov/exclusions/exclusions_list.asp, and health care providers have an “affirmative duty” to check to ensure that excluded individuals are not working in their facilities or face significant fines. Last week, about 40 AHCA/NCAL Future Leaders and Political Ambassadors visited Washington for Advocacy Training and meetings with their Members of Congress from Wednesday to Friday. Both groups were able to attend a reception for the Congressional Black Caucus (CBC), where, despite votes in the House and stormy skies, Assistant Democratic Leader James Clyburn (D-SC) and several other members talked with the advocates Wednesday evening. 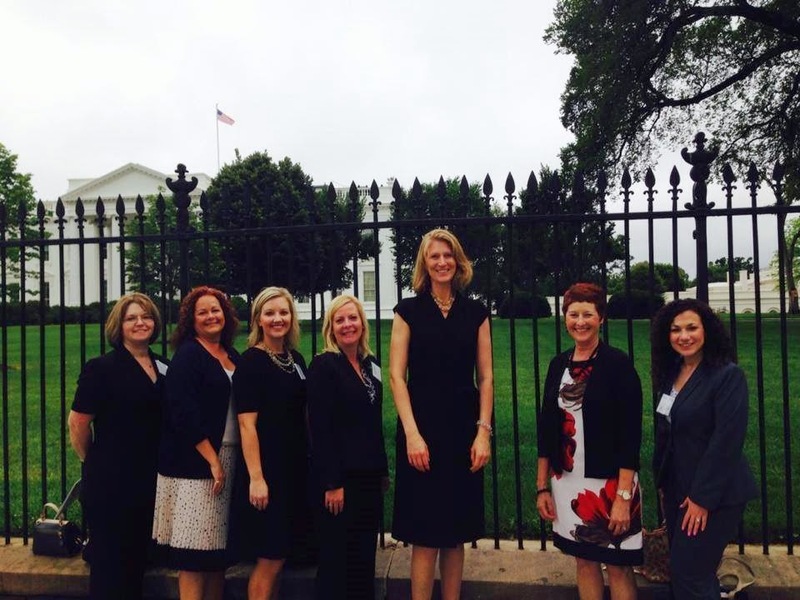 The next morning, AHCA Political Ambassadors were able to join a special White House summit focusing on women’s leadership, where they discussed the long term care profession with White House staff and were able to snap a picture along the way. Finally, all groups gathered Thursday afternoon to meet with over 70 Congressional offices on both sides of the aisle, reinforcing AHCA/NCAL’s progress on the Quality Initiative despite ongoing Medicare cuts. Earlier this week, AHCA submitted comments on behalf of AHCA member nursing centers and intermediate care facilities for individuals with intellectual disabilities (ICF/IIDs) to CMS on the proposed rule that adopts the 2012 Edition of the Life Safety Code. The proposed rule was released on April 16, 2014, and would amend the fire safety standards for, among other provider types, Medicare and Medicaid participating long-term care facilities and ICF/IIDs. AHCA received member feedback, and incorporated these thoughts into the AHCA comment letter to CMS. If you have any questions about the 2012 Edition of the Life Safety Code or AHCA submitted comments to CMS, please contact AHCA’s Senior Director of Regulatory Services, Lyn Bentley. “Skilled nursing care centers continue to be encouraged by MedPAC’s steadfast pursuit of a site-neutral payment system for post-acute care. With their recommendation today, MedPAC is a welcome addition to a long list of policymakers who support the need to fix the unbalanced approach to Medicare payments. “When post-acute care settings provide similar services to similar patients, they should be reimbursed at a similar amount. MedPAC has reaffirmed what we have all known for some time, that providers are paid differently simply because of their setting. A site-neutral payment system would focus on the patient and their needs, regardless of setting, and encourage all settings to provide efficient, high-quality care. The University of Iowa's School of Social Work is offering this free webinar on Tuesday, July 1, 2014 1:00 PM – 2:30 PM (Eastern Time). Join Erica Wood, from the American Bar Association's "Commission on Law and Aging," for an information-filled session about guardianship. This session will last 90 minutes (including 15 minutes for questions from the audience). This session will define guardianship and review common legal terms associated with the concept, explain that each state has its own version (although people in all states face some of the same challenges when considering whether to get a guardian appointed for a person with cognitive impairment) and explain how guardianship affects an individual's rights. Erica Wood will also discuss options other than guardianship and how to weigh options. Erica Wood's presentation will conclude with an overview of the role of the nursing home social work in terms of resident guardianship. According to an article in the Daily Caller, President Obama’s Administration recently approved another year-long delay of the Affordable Care Act’s (ACA’s) small business exchanges for 18 different states. As noted in previous Capitol Connection communications, the Small Business Health Options Program (SHOP) was created in the ACA, and is a new way for small businesses to buy health insurance for their employees. Last month, CMS announced that it would allow state insurance commissioners to request an extension for the SHOP exchanges. The Agency approved every request it received to delay implementation of the SHOP exchanges until 2016. The SHOP exchanges were originally expected to launch along with the individual ACA exchanges on October 1, 2013, but the Obama Administration initially delayed the SHOP website until November 2014 in order to focus on fixing the issues with HealthCare.gov. Noted in the Daily Caller article, 17 states and the District of Columbia are now operating their own SHOP exchanges. Another 14 states with federally-run exchanges will launch their marketplaces in 2015, after accepting the initial one-year delay from the Administration. According to the article, Alabama, Alaska, Arizona, Delaware, Illinois, Kansas, Louisiana, Maine, Michigan, Montana, New Hampshire, New Jersey, North Carolina, Oklahoma, Pennsylvania, South Carolina, South Dakota and West Virginia are the only states remaining without a promised SHOP exchange for small business employees. CMS will host a Special Open Door Forum (ODF) to allow Durable Medical Equipment Prosthetics, Orthotics and Supplies (DMEPOS) suppliers, physicians, treating practitioners, ambulance suppliers and other interested parties to learn about new prior authorization initiatives recently announced by CMS. The initiatives that will be discussed include the Medicare Expanded Prior Authorization Demonstration for Power Mobility Devices (PMDs) Demonstration, the Hyperbaric Oxygen and Repetitive Scheduled Non-Emergent Ambulance Transport prior authorization models and a new proposed rule for prior authorization for certain durable medical equipment, prosthetics, orthotics, and supplies. The purpose of this Special Open Door Forum (ODF) is to provide an opportunity for suppliers and providers to receive information on all of the prior authorization initiatives. On September 1, 2012 the CMS implemented a prior authorization process for PMDs (scooters and power wheelchairs) in seven states with high populations of fraud- and error-prone providers (CA, IL, MI, NY, NC, FL and TX). Initial data indicates that the Prior Authorization Demonstration was successful in reducing spending and improper payments for PMDs. The CMS believes the recent decrease in overall spending is due in part to national Durable Medical Equipment, Prosthetics, Orthotics, and Supplies (DMEPOS) suppliers adjusting their billing practices and reflects suppliers complying with CMS policies based on their experiences with prior authorization in the demonstration states. Prior authorization is driving initial successes, ensuring that only beneficiaries who meet Medicare requirements receive a PMD. Suppliers have also increased compliance with CMS policies based on their experiences with prior authorization in the demonstration states. Based on the demonstration’s initial success in reducing spending and improper payments, and the support received by various stakeholders, CMS seeks to expand the current demonstration to 12 additional states, for a total of 19 states, with all demonstration requirements remaining the same. Those states include: Pennsylvania, Ohio, Louisiana, Missouri, Maryland, New Jersey, Indiana, Kentucky, Georgia, Tennessee, Washington, and Arizona. CMS also proposes to establish a prior authorization process for certain durable medical equipment, prosthetics, orthotics, and supplies items that are frequently subject to unnecessary utilization. Through a proposed rule, CMS will solicit public comments on this prior authorization process, as well as criteria for establishing a list of durable medical items that are frequently subject to unnecessary utilization that may be subject to the new prior authorization process. The proposed rule may be found here. The deadline to submit comments is July 28, 2014. Participants will not be able to ask questions on the call but we encourage participants to submit questions prior to the call to the Special ODF to: MedicareMedicalReview@cms.hhs.gov. A transcript and audio recording of this Special ODF will be posted to the Special Open Door Forum website at : http://www.cms.gov/OpenDoorForums/05_ODF_SpecialODF.asp and will be accessible for downloading. For automatic emails of Open Door Forum schedule updates (E-Mailing list subscriptions) and to view Frequently Asked Questions please visit their website at http://www.cms.gov/opendoorforums/. 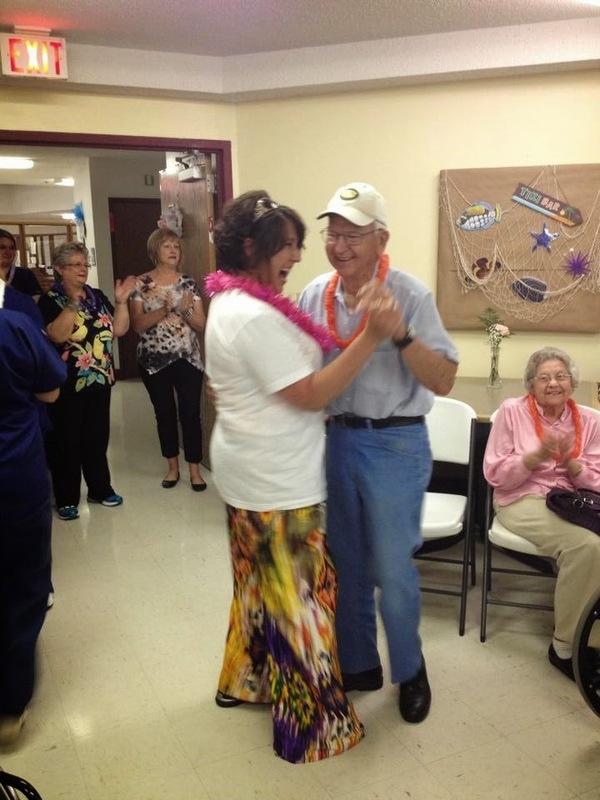 The 2014 National Nursing Home Week (NNHW) theme “Living the Aloha Spirit” was a huge hit all across the US. 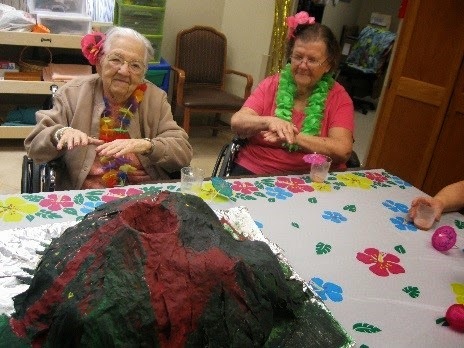 AHCA members embraced Hawaiian pride with the spirit of kindness and respect as they found joyful and entertaining ways to celebrate with staff, residents, family members and volunteers. Many centers had an influx of local VIPs, proclamations signed by mayors and governors and most saw an increase in media coverage of the week’s activities. 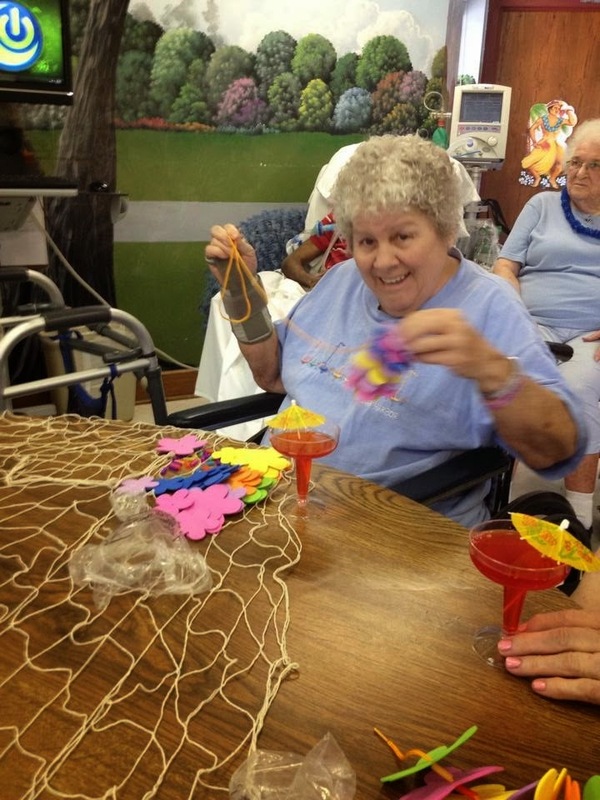 Nursing care centers demonstrated the “Aloha Spirit” theme in a variety of ways throughout the week and even beyond the week-long celebration. The creativity and hard work at the care centers displayed the dedication people have in long term and post- acute care centers. These festivities showed what a person-centered team, interacting while having fun, can look like. 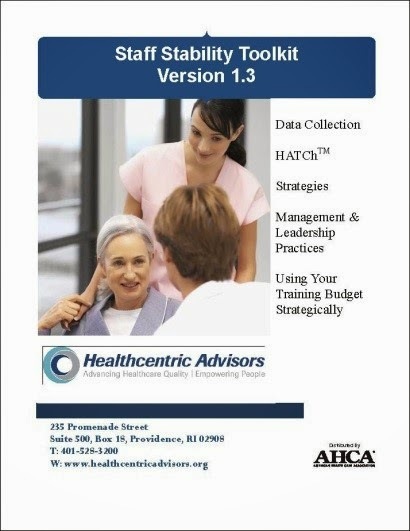 AHCA provided members with a Planning Guide and Product Catalogue to help them have successful events. Mother’s Day introduced the week of Living the Aloha Spirit with a variety of fun activities. These included everything from live entertainment with Hawaiian-themed music, glamour shots, spa nights and breakfasts with family, to tea party socials, sundaes on Sunday, and flowers with family. 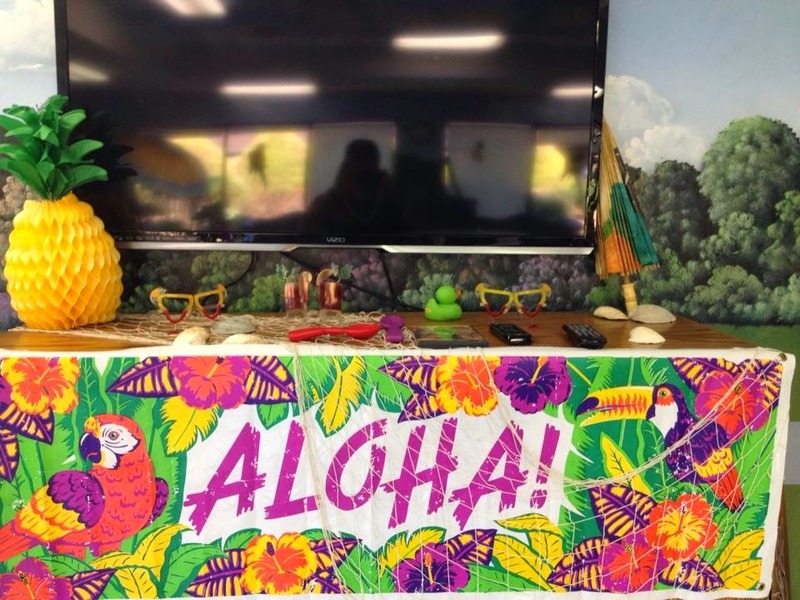 The fun continued through the week with virtual trips to Hawaii, Aloha Bingo, cultural lessons on Hawaiian traditions, Hawaiian language classes and more. There were specialty scenic photo sessions, building your own volcanoes, leis, tiki masks, and “So You Think You Can Hula” dance competitions. Many ended the week with traditional Hawaiian Luaus complete with costumes and feasts. It was an impressive display of how fun never gets old. 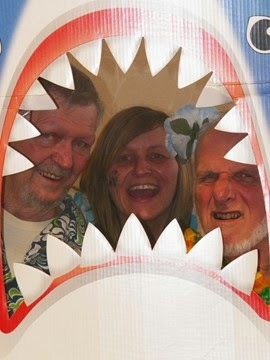 Check out the many colorful photos and postings on the NNHW Facebook page to relive the Aloha Spirit yourself. 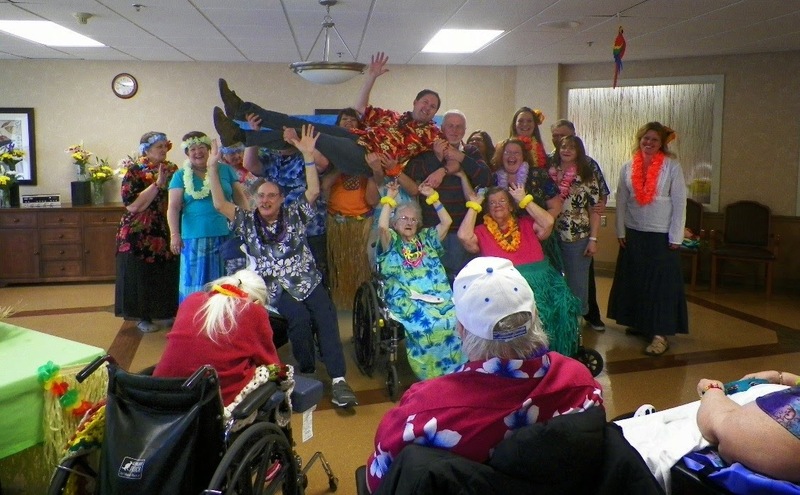 Below are some of the examples of staff, volunteers, residents and family enjoying the Aloha Spirit to the fullest. The power of small acts of recognition isn’t lost on sector leaders as they work to cut down on preventable hospital readmissions, according to this month’s cover story. To no one’s surprise, the evidence shows that a well-trained staff can make all the difference in keeping those ambulances in the garage. That’s why visionary providers are already ahead of the readmissions curve: They’ve focused on building, and keeping, top-notch staff. In Focus on Caregiving, author Lori Shibinette makes the case that new check-the-box EMR technology doesn’t supplant the need for narrative nurses’ notes. A nurse’s description of actual patient care is not only necessary for the next shift, it could be the only documentation a center has in the event of a lawsuit. 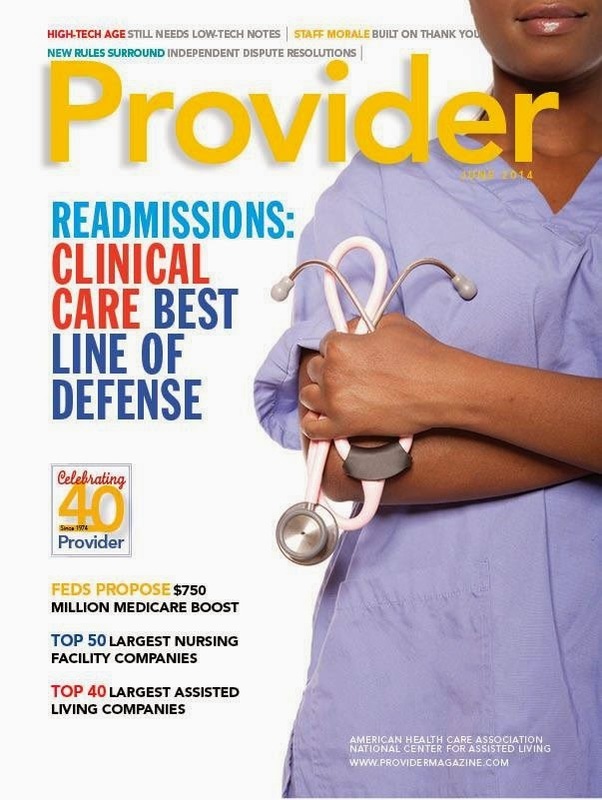 And, in a special feature, nurse assessment coordination expert Betty MacLaughlin Frandsen explains the intricacies of new CMS rules on when and how facilities can appeal for an independent informal dispute resolution. Finally, June is the month when we compile our annual list of the Top 50 Largest Nursing Home Companies and the Top 40 Largest Assisted Living Companies. Significant this year is Brookdale Senior Living regaining its longtime No. 1 largest spot in the Top 40 list, having lost it briefly to Emeritus Senior Living in 2013. Secretary Burwell was confirmed in the Senate on a 78-17 vote last Thursday, June 5th. Burwell, the former director for the Office of Management and Budget, was widely praised by Senators on both sides of the aisle in her confirmation hearings. Many top Republicans praised her for her commitment to transparency regarding President Obama’s signature health care law. “[Burwell] is an extremely competent person who will answer your questions,” said Sen. Johnny Isakson (R-GA), who is a member of the Senate’s top health care committees. Burwell was nominated by President Obama shortly after Kathleen Sebelius announced in April that she would be resigning from her post at the head of HHS. “Congrats and good luck to my friend Sylvia Mathews Burwell!” Sebelius said on Twitter Monday. Join the American Health Care Association (AHCA) and the National Association for the Support of Long Term Care (NASL) for The Critical Role of Rehabilitation Therapy in the SNF PPS, Post-Acute Reform and Long Term Care. Held on Sunday, October 5, this Constituency Educational Program is ideal for rehabilitation therapist, contract therapy executives and providers, clinical staff, administrators and billing/reimbursement specialists. Experts will provide the latest information on cutting edge rehabilitation therapy outcomes research, policy, quality, Part A and Part B payment, and clinical issues. We will also explore key government initiatives to redesign therapy payment as well as AHCA and NASL rehabilitation initiatives. We will bring all the issue streams together in a comprehensive examination of nursing facility rehabilitation therapy. This is a separate ticketed event or may be purchased in combination with the Premium/Full Meeting Package. Registrations can be made through AHCA by visiting our official website, www.AHCAconvention.org, or through the NASL website, www.NASL.org. Early bird registration for the AHCA/NCAL Convention & Expo continues through July 18, register today! The Centers for Medicare and Medicaid Services (CMS) recently announced the establishment of a Provider Relations Coordinator to help increase program transparency and offer more efficient resolutions to providers affected by the medical review process. The Provider Relations Coordinator’s purpose is to improve communication between providers and CMS. While providers should continue to take questions about specific claims directly to the Recovery Auditor or Medicare Administrative Contractor (MAC) who conducted the review, providers can raise larger process issues to the Coordinator. For example, if a provider believes that a Recovery Auditor is failing to comply with the documentation request limits or has a pattern of not issuing review results letters in a timely manner, CMS encourages providers to contact the Provider Relations Coordinator. Prior to the establishment of this new CMS initiative, AHCA members often contacted AHCA staff to help facilitate an escalation of their medical review issues with CMS. Hopefully this new process will help streamline the resolution of such issues. CMS indicted that providers can also send suggestions about how to improve the Recovery Auditor or MAC medical review process to the CMS Provider Relations Coordinator. If you have any questions or are not satisfied with CMS follow-up when using this new process, please contact Dianne De La Mare or Dan Ciolek at AHCA. The Centers for Medicare and Medicaid Services (CMS) “Items and Services That Are Not Covered Under the Medicare Program” Booklet (ICN 906765) was revised and is now available in downloadable and hard copy format. This booklet is designed to provide education on noncovered items and services. It includes information about the four categories of items and services that are not covered under the Medicare Program and applicable exceptions (items and services that may be covered) and Beneficiary Notices of Noncoverage. The Center for Medicare Advocacy (CMA) has filed a class action lawsuit against the US Health and Human Services (HHS), alleging that the first two levels of the five level Medicare appeals process are merely “rubber stamp” coverage denials. According to CMA Executive Director, Judith Stein, “Most beneficiaries don’t have the resources, time or support to take their claims all the way to an Administrative Law Judge making the first two levels of review vitally important. 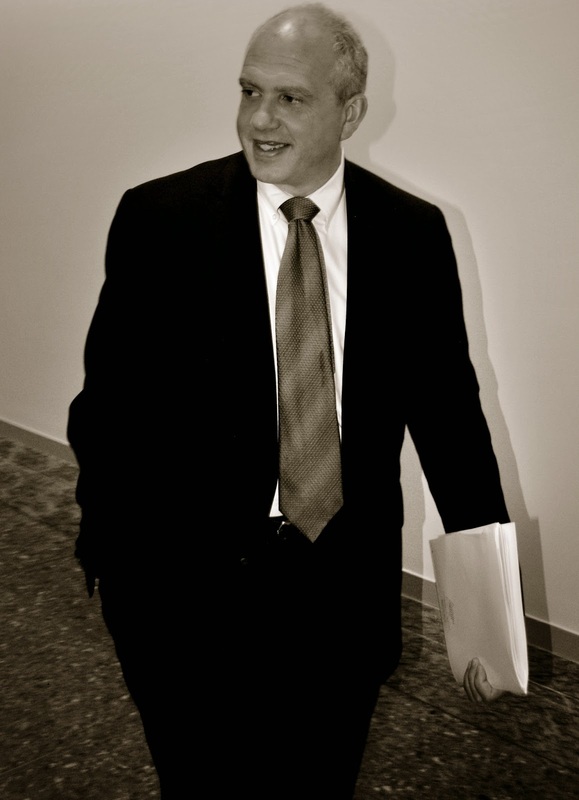 ‘Rubber-stamping’ appeals deprives a huge number of people a legitimate review process and harms those who depend on the Medicare coverage for critical health care and to maintain their quality of life.” This CMA suit was filed just weeks after the American Hospital Association (AHA) sued HHS over the backlog at the third level of appeal to compel the agency to meet the statutory deadlines for reviewing a Medicare appeal. This past March, CMS conducted a successful ICD-10 testing week, with approximately 2,600 testers (providers, suppliers, billing companies and clearinghouse organizations) submitting more than 127,000 claims with ICD-10 codes to the Medicare Fee-For Service (FFS) claims system. The testing week allowed an opportunity for both the Centers for Medicare & Medicaid Services (CMS) and testers to learn valuable lessons about ICD-10 processing. In many cases, testers intentionally included errors in their claims to make sure that the claim would be rejected (i.e., a process known as negative testing). For proper processing, all claims had to have a valid diagnosis code matching the date of service and a valid national provider identifier. Further, the claims using ICD-10 had to have an ICD-10 companion qualifier code and the claims using ICD-9 had to use the ICD-9 qualifier code. Claims that did not meet those requirements were rejected. Nationally, CMS accepted 89 percent of the test claims, with some regions reporting acceptance rates as high as 99 percent. The normal FFS Medicare claims acceptance rates average between 95 beginning percent. The US Department of Health and Human Services (HHS) expects to release an interim final rule in the near future that will include the new compliance date that would require the use of ICD-10 beginning October 1, 2015. The rule also would require the Health Insurance Portability and Accountability Act (HIPAA) covered entities to use ICD-9 through September 30, 2015. Providers, suppliers, billing companies and clearinghouses are welcome to submit acknowledgement test claims anytime up to October 1, 2015. Submitters should contact their local Medicare Administrative Contractor (MAC) for more information about acknowledgment testing. The 2015 General Equivalence Mappings (GEMs) and Reimbursement Mappings are now available on the CMS 2015 ICD-10-CM and GEMs web page and 2015 ICD-10-PCS and GEMs web page. These mappings can be used to convert policies from ICD-9-CM to ICD-10 codes. The GEMs provide both forward (ICD-9-CM to ICD-10) and backward (ICD-10 to ICD-9-CM) mappings. By way of background, AHCA/NCAL previously reported that CMS had provided updates on the extension of the partial code freeze for ICD-9 and ICD-10 that were required to delay implementation of ICD-10 until no earlier than October 1, 2015. Along with this announcement, CMS posted updated 2015 ICD-9 and ICD-10 files; but also alerted the public that the 2015 GEMS would be released in the future. In May, the US Department of Health and Human Resources, Office of Inspector General (OIG) published a proposed rule, Fraud and Abuse: Revisions to the Office of Inspector General’s Civil Monetary Penalty Rules that would amend the health care program civil monetary penalty (CMP) regulations. The proposed rule would codify the OIG’s expanded statutory authority under the Affordable Care Act (ACA) to impose CMPs on providers and suppliers and would allow for significant penalties. For example, the proposed rule would permit the OIG to impose $10,000 per day penalties on providers and suppliers who fail to timely report and return an identified overpayment. This proposal could increase the OIG’s ability to leverage substantial penalties beyond that which is permitted under current regulations. Further, OIG proposes permitting CMPs for conduct including: failure to grant OIG timely access to records; ordering or prescribing while excluded when the excluded person knows that the item or service may be paid for by a federal health care program; making false statements, omissions or misrepresentations in enrollment to a federal health care program; or making or using a false record that is material to a false or fraudulent claim. AHCA/NCAL will submit formal comments by the July 11th deadline in response to OIG’s proposed rule, and ask that you submit any feedback or comment by Monday, July 2nd directly to Lyn Bentley at lbentley@ahca.org or Dianne De La Mare at ddmare@ahca.org. In May, the US Department of Health and Human Resources, Office of Inspector General (OIG) published a proposed rule, Fraud and Abuse: Revisions to the Office of Inspector General’s Exclusion Authorities that would significantly expand the exclusion regulations applicable to persons or entities that receive, directly or indirectly, funds from federal health care programs (including Medicare and Medicaid programs). The Affordable Care Act (ACA) expanded OIG’s authority for exclusion and authorized the use of testimonial subpoenas in investigations of exclusion cases. In the proposed rule, OIG incorporates these statutory changes, revises the definitions applicable to exclusions, proposes early reinstatement procedures and offers a number of proposed policy changes as to when and how exclusions take place. AHCA/NCAL will submit formal comments by the July 8th deadline in response to OIG’s proposed rule, and asks that you submit any feedback or comment by Monday, June 30th directly to Dianne De La Mare at ddmare@ahca.org. The US Department of Health and Human Services (HHS), Office of Inspector General (OIG) has released its Semiannual Report to Congress, which summarizes OIG activities for the 6-month period ending March 31, 2014. During this reporting period, OIG ramped up its oversight efforts to implement the Affordable Care Act (ACA); ensured the appropriate use of prescription drugs by Medicare and Medicaid beneficiaries; and identified vulnerabilities in, and recommendations for improving, the Centers for Medicare & Medicaid Services’ (CMS) oversight of contractors that administer more than a half trillion dollars in benefits each year. The report specifically highlights the first half of FY 2014, and OIG’s expectation of more than $3.1 billion in recoveries consisting of nearly $295 million in audit receivables and about $2.83 billion in investigative receivables, which include about $813.7 million in non-HHS investigative receivables resulting from OIG work in areas such as the States’ shares of Medicaid restitution. Further, OIG reports 465 criminal actions against individuals or entities that engaged in crimes against HHS programs; and 266 civil actions, which include False Claims Act (FCA) and unjust-enrichments lawsuits filed in federal district court, Civil Monetary Penalties (CMP) settlements and administrative recoveries related to provider self-disclosure maters. OIG also reported exclusions of 1,720 individuals and entities from participation in Federal health care programs. Specific to nursing facility (NF) centers, OIG notes two previously released reports (Adverse Events in Skilled Nursing Facilities: National Incidence Among Medicare Beneficiaries and Medicare Nursing Home Resident Hospitalization Rates Merit Additional Monitoring); as well as the OIG settlement with Ensign, who agreed to pay $48 million to resolve civil allegations under the FCA that it knowingly submitted false claims to Medicare for rehabilitation therapy services at six of its SNFs. To obtain a complete copy of the report go to http://oig.hhs.gov/reports-and-publications/semiannual/index.asp. The confirmation of Sylvia Matthews Burwell, the Obama Administration’s pick to replace Kathleen Sebelius as Secretary of Health and Human Services, is expected to be voted on by the full Senate this week. Burwell was announced as Sebelius’s replacement the same day the Secretary announced her resignation in early April. Though Sebelius and the Department of Health and Human Services (HHS) faced much scrutiny from Members of Congress, primarily surrounding the implementation of the Affordable Care Act, Burwell’s confirmation is expected to be bipartisan. Burwell, the former head of the Office of Management and Budget (OMB), has already testified at hearings in front of the Senate Finance and Help, Education, Labor, & Pensions (HELP) Committees, the two Senate groups with authority over healthcare matters. Last year’s Senate rule change that eliminated the ability for the minority to filibuster Presidential nominations to the cabinet and circuit courts almost guarantees Burwell’s confirmation. Burwell’s new assignment started a cabinet shuffle which brought Burwell into HHS, former head of Housing and Urban Development (HUD), Secretary Shaun Donovan, to take Burwell’s old position at the helm of OMB, and former Mayor of San Antonio Julián Castro to the position of Secretary of HUD. The US Department of Health and Human Services, Centers for Medicare & Medicaid Services (CMS) Innovation Center announced the launch of round two of the State Innovation Model initiative (SIM) and up to $730 million in funding to help states design and test improvements to their public and private health care payment and delivery systems. The SIMs initiative will provide financial and technical support to states to design or test innovative payment and service delivery models that will improve health, improve care and lower cost for Medicare, Medicaid, and Children’s Health Insurance Program beneficiaries. CMS will award up to $30 million for up to 15 Model Design cooperative agreements and up to $700 million in funding for up to 12 state-sponsored Model Test cooperative agreements through this funding announcement. In 2013, CMS awarded the first round of SIM funding to 25 states. For an overview of SIM post-acute and long-term care impacts see the attached AHCA/NCAL summary document of the 25 currently funded projects. Are your staff members happy in their jobs? A recent article published in the New York Times, entitled Why You Hate Work, provides an interesting look at the current state of employee engagement and satisfaction. The article suggests that employees across the country are less engaged than ever before, and looks at the root cause of those engagement issues. Surprisingly, the root causes identified by the article can be easily addressed without a significant price tag! The staff satisfaction guide from AHCA/NCAL provides practical, low cost ways, on how to address some of these important factors driving staff satisfaction. Implementing just a few of these could increase your customer satisfaction and business outcomes by helping you build a more committed and motivated workforce. Increasing Staff Stability is also one of the four Quality Initiative goals. Creating a stable workforce will also directly impact your success in achieving the other three Quality Initiative Goals. Don’t delay- download the staff satisfaction guide today! Access more resources at qualityinitiative.ahcancal.org. Last week, AHCA/NCAL released the names of 390 long term and post-acute care centers that have earned a 2014 Bronze - Commitment to Quality Award. The award is the first of three distinctions possible through the AHCA/NCAL National Quality Award program, which honors skilled nursing centers and assisted living communities across the nation that have demonstrated their commitment to improving quality care for seniors and individuals with disabilities. A full list of the recipients is available on the AHCA/NCAL website. Implemented by AHCA/NCAL in 1996, the National Quality Award Program is centered on the core values and criteria of the Baldrige Performance Excellence Program. The program assists providers of long term and post-acute care services in achieving their performance excellence goals. The program has three levels: Bronze, Silver, and Gold. Centers begin the quality improvement process at the Bronze level, where they develop an organizational profile with fundamental performance elements such as vision and mission statements and an assessment of customers’ expectations. Bronze applicants must also demonstrate their ability to implement a performance improvement system. Trained Examiners review each Bronze application to determine if the center has met the demands of the criteria. As a recipient of the Bronze - Commitment to Quality Award, these centers may now move forward in developing approaches and achieving performance levels that meet the criteria required for the Silver - Achievement in Quality Award. AHCA/NCAL will announce the 2014 Silver - Achievement in Quality and Gold – Excellence in Quality Award recipients in the coming months. The National Quality Award program is sponsored by AHCA/NCAL Associate Business Members My InnerView, by National Research Corporation and PointRight. My InnerView represents the true voice of nursing home and assisted living residents, families, and employees with the most insightful quality measurement solutions and satisfaction surveys in the healthcare continuum. PointRight is the recognized leader in data-driven analytics for health care and insurance. The recipient centers will be honored during the AHCA/NCAL’s 65th Annual Convention and Exposition, October 5-8, 2014, in Washington, DC. The US Department of Health and Human Services, Centers for Medicare & Medicaid Services (CMS) Innovation Center announced the first batch of prospective recipients for the Health Care Innovation Awards (HCIA) Round Two on May 22, 2014. Twelve prospective recipients could receive as much as $110 million in combined funding, ranging from an expected $2 million to $18 million over a three-year period. Round two focuses on four other priority areas including rapidly reducing costs for patients with Medicare and Medicaid; improving care for populations with specialized needs; testing improved financial and clinical models for specific types of providers; and linking clinical care delivery to preventative and population health. The second and final batch for round two will be announced in the coming months. To obtain more information on the HCIA program go to http://innovation.cms.gov/initiatives/Health-Care-Innovation-Awards/Round-2.html or review the HHS fact sheet at http://www.hhs.gov/news/press/2014pres/05/20140522a.html. · Standardizing Notices to Improve Consumer Education and Choices: In order to provide clear information to consumers when insurers make changes to their health insurance coverage, today, HHS finalized rules requiring issuers to use standardized notices when renewing coverage or discontinuing products. These notices will help to ensure that consumers understand the changes and choices in the individual and small group market. · Strengthening the Prescription Drug Exceptions Process: The final rule builds upon the requirement that plans providing Essential Health Benefits (EHB) have procedures in place allowing enrollees to request and gain access to clinically appropriate drugs not covered by the plan. Building upon this standard, today’s rule requires that these procedures include an expedited exceptions process for enrollees suffering from a health condition that may seriously jeopardize the enrollee’s life, health, or ability to regain maximum function, or when an enrollee is undergoing a current course of treatment using a drug not covered by the plan. As part of this expedited process, health plans must make coverage determinations within no more than 24 hours after receiving the request, and must continue to provide the drug throughout the duration of the enrollee’s medical issue. · Implementing Quality Standards: To help empower consumers, the final rule takes the next step in making quality information available to consumers while they shop for plans in the Marketplace. Building upon the existing Qualified Health Plan (QHP) certification requirements related to quality reporting and implementation of quality improvement strategies, we are requiring insurers to submit data to support the calculation of the quality ratings. HHS will specify the form, manner, reporting level, and timeline in future technical guidance. Marketplaces must display the HHS-calculated quality ratings and enrollee satisfaction survey results in a clear and standardized manner starting in 2016. · Providing Additional Options for SHOP in 2015: Today’s rule aligns the start of annual employer election periods in Federally-facilitated (FF)-SHOPs for plan years beginning in 2015 with the start of open enrollment in the individual market Exchange for the 2015 benefit year to minimize confusion and maximize efficiency. The rule also lists the conditions under which a SHOP would be permitted to not implement “employee choice” in which employers would allow employees to choose one plan, rather than any health plan within a metal tier, if their State Insurance Commissioner believes it is in the best interest of consumers in their State. · Strengthening Standards for Navigators and Other Assisters: In order to ensure that Navigators and other assisters are able to carry out their responsibilities to help consumers enroll in insurance coverage while meeting federal requirements for assister programs, the rule specifies a non-exhaustive list of state requirements that would conflict with the federal standards established for assisters and Marketplace assister programs under title I of the Affordable Care Act. HHS developed these provisions after consultation with stakeholders (including states, non-profit community-based organizations, hospitals, and community health centers), as well as its ongoing monitoring of state laws and their effects on assister programs. In addition, today’s rule codifies and strengthens many of the standards already in practice that are applicable to the different consumer assistance entities and individuals. For example, the rule would prohibit assisters from specified solicitation activities such as offering cash or gifts other than those that are nominal as an inducement to enroll in coverage. The rule would also formalize that assisters cannot charge for services they are certified by the Marketplace to provide and must be recertified annually. · Clarifies Premium Stabilization Policies: We are finalizing without change our proposal to raise the ceiling on allowable administrative costs and raise the floor on profits by 2-percentage points in the risk corridors formula. This adjustment will be applied uniformly in all states for 2015 to help with unexpected administrative costs and pricing uncertainties. The rule finalizes our proposal to allocate reinsurance contributions to the reinsurance payment pool before payments for administrative expenses and to the Treasury if there is a shortfall in the collection of the reinsurance fee. Lastly, we finalize various amendments to the medical loss ratio (MLR) provisions, including standards that would modify the timeframe for which issuers can include their ICD-10 conversion costs in their MLR calculation and account for the special circumstances of issuers during the transition to the 2014 reformed market. The core requirements of the MLR program, for example the requirement that insurers spend at least 80 percent (small group market), or 85 percent (large group market) of premiums on health care and quality improvement, are not affected by these proposed adjustments. To obtain a copy of the final rule go to http://www.cms.gov/CCIIO/Resources/Regulations-and-Guidance/Downloads/508-CMS-9949-F-OFR-Version-5-16-14.pdf. To obtain a copy of CMS’ factsheet on the final rule go to The 2015 Exchange and Insurance Market Standards Final Rule can be accessed here: http://www.cms.gov/CCIIO/Resources/Fact-Sheets-and-FAQs/marketstandards-5-16-2014.html. According to the Spring 2014 update to the Department of Health and Human Services’ Regulatory Agenda, the agency plans to publish new proposed rules for the Medicare Shared Savings Program (MSSP), which regulates Accountable Care Organizations (ACOs). The Regulatory Agenda also lists an updated rule pertaining to fraud and abuse waivers provided to Medicare ACOs. Both of these new rules could have significant implications for skilled nursing and other post-acute providers who currently work with ACOs. AHCA will analyze these rules once they are published and will respond with official comments to CMS. Just recently AHCA released an ACO Contracting Guide for SNF Providers, which provides a robust discussion of the current ACO rules. Members can access the tool here. 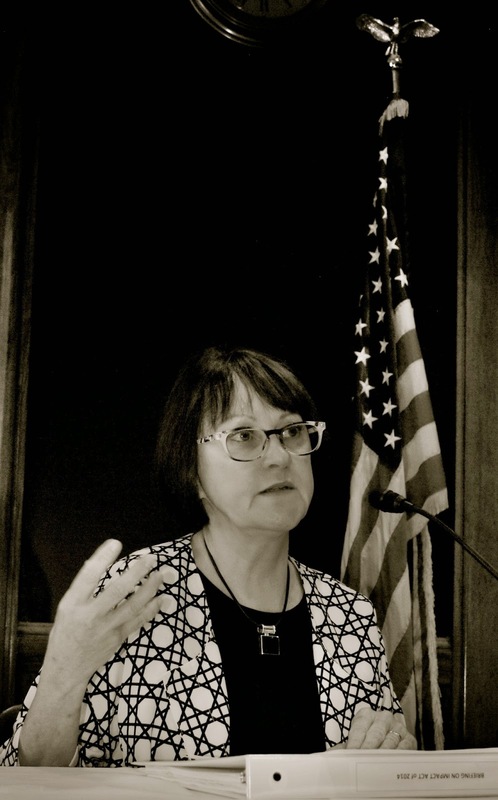 Last week, AHCA talked about the great work of Susan Eaton, the late Harvard & Kennedy School of Government professor who identified the practices of high performing nursing centers that significantly decreased staff turnover. For fifty five homes (involved in a workforce pilot study) that adopted these practices, their results were impressive. Over the course of 9 months the Nursing Departments (RN, LPN, CNA) turnover rates experienced a relative change of -10% which, when annualized, = 196 fewer terminations at a direct-cost savings = $490,000. Through the pilot, these 55 homes saw a pattern emerge that looked like this: staff stability practices put in place led to>better retention>led to individualized care>led to better quality>led to increased census>which led to a better bottom line. It was the first time that the link was made between staff stability to quality care to bottom line! Another great tool is the Retention Committee Discovery Assignments which sends members of your Retention Team on a fact finding mission to learn from current staff important information about your organization. This resource serves as the ultimate guide in helping to stabilize staff and gathering ideas from others. Even those who are not having staffing issues at the moment will find many great ideas to further supplement their retention program.